Selectric and Selectric II type elements (balls) have 88 characters and white lettering. Selectric III balls have 96 characters, yellow writing, and say "96". These are 600 dpi black and white (not greyscale) scans from the mid 1970s IBM Type Styles and Elements brochure. There are six pages, each with several fonts. Type elements were also available from other companies besides IBM. Browse a 1986 GP Technologies Typing Element Handbook. I do not have any manuals for sale...sorry! 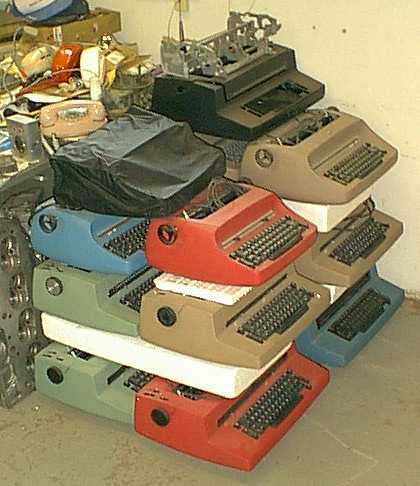 Here is a picture of some IBM Selectric tools, given to me by a kind fellow who used to service these machines. 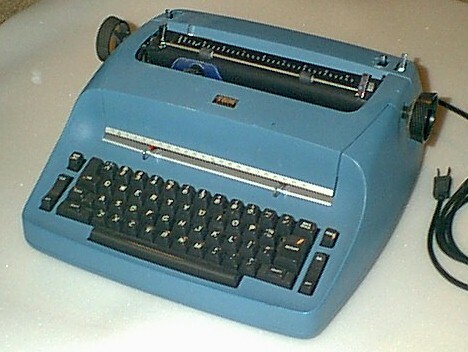 The blue 1972 IBM Selectric typewriter. One of my first Selectrics, I found it (and it's pink twin) at the swap meet, for an irresistable price. I got it working pretty well, but the pink one has a major problem that I need to fix (when I get really bored). 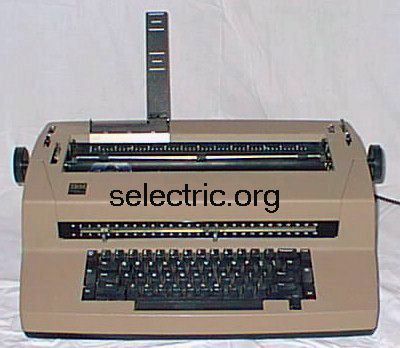 The IBM Selectric was introduced in 1961 (just like me! ), and was revolutionary, in that the platen does not move, but instead the type element moves. The single type element (ball) has 88 characters on it, in 4 rows. 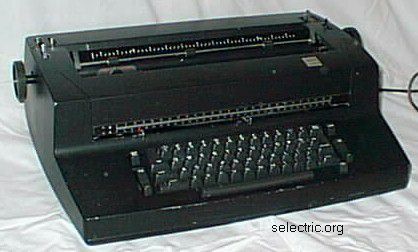 This typewriter is a model 72, with a cloth ribbon in a plastic cartridge. It is a narrow platen model, they were available in 3 widths that I know of. The insides of the pink typewriter. In case you were wondering what's inside that pretty case. I have figured out how quite a bit of it works, but some of it is still a mystery. Everything moves so quickly, it's hard to see just what's going on. The basic operation is that two thin, flat metal wires pull the ball into the correct position for each character, then a turning shaft with a cam on it pushes the ball against the paper. The different characters are all coded into the keyboard, which moves different levers to move the ball different amounts. Shifting simply pulls one of the wires enough to turn the ball exactly half way around. This is my "useful" typewriter. From a school auction, I have spent a bit of time getting it to work well. It's a pleasure to use now. Features dual pitch, either 10 or 12 spaces per inch, and line-and-a-half vertical spacing. Full width 15" platen. The correcting feature is a big help for lousy typists like me. This typewriter was built in the late 1970s, although the design was introduced about 1973. 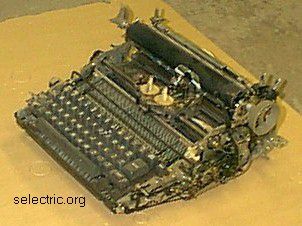 This is the ultimate typewriter! Has all the features of the Correcting Selectric II, plus a redesigned keyboard and 96 character type element. Best of all, they finally figured out how to let you easily tell when the paper is near the end--with that black thing sticking up with the lines on it. Earlier Selectrics have a useless end of page indicator built into the right platen knob. This typewriter dates from the mid 1980s, and thousands of similar ones are still in operation in government offices, schools, banks, and many other businesses to this day.